I’ve had these pics over on my Gnome Press Flickr site for almost a year. Since I posted a Review for this title recently, it’s past time to get the Close Up done. A somewhat odd cover. Kind of stylized and I didn’t like it much at first. I’m a very classic ‘Golden Age’ cover kind of guy. The covers for Pattern for Conquest and Cosmic Engineers being two of my favorites. It grew on me however, and I’m not adverse to it now. It does thought present a nice segway from Golden Age art into the New Age nonsense represented by the likes of The Philosophical Corps. 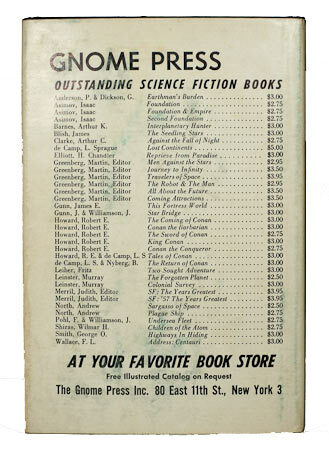 Come to think of it, because Gnome Press spanned a period of time running from the tail end of the Golden Age to the beginnings of the New Age, the evolution of their cover art provides an interesting commentary. I might post about that sometime. Anyway, check out the cover below. The artwork quite accurately depicts our two heroes – Fahrfrd and the Grey Mouser. 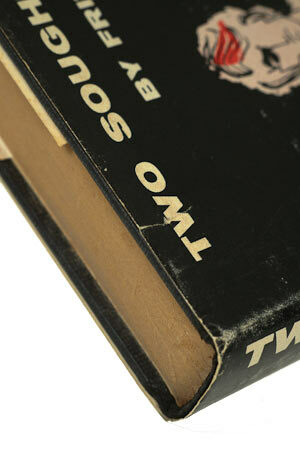 Some slight rubbing on the cover that is somewhat masked by the appearance of the artwork. Around the jacket where the block sits against the flaps there is some foxing on the unprotected areas there. The boards are a little rubbed, but in generally good condition. From the top and bottom we can see the typical GP browning of the block. Though it’s not too bad for a book of this vintage. You can see that the edges of the jacket are in quite nice condition as well. Except for one thing. This view, while illustrating the nice condition of the edging, hints at two major problems with this copy. First, there is a 1cm tear through the ‘W’ on the front. And you can see the rubbing on the spine of the jacket is quite bad. Close photography always really highlight cosmetic issues like this. The tail of the spine presents no issues except that damn rubbing. The back of the jacket exhibits more of the endemic rubbing. 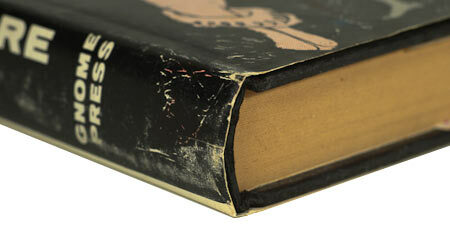 Binding: Black boards with red lettering on the spine. 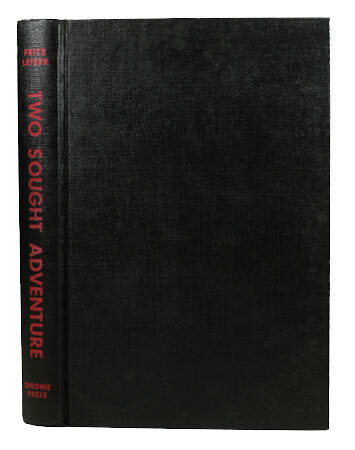 Chalker & Owings: TWO SOUGHT ADVENTURE, by Fritz Leiber, 1957, pp.186, $3.00. 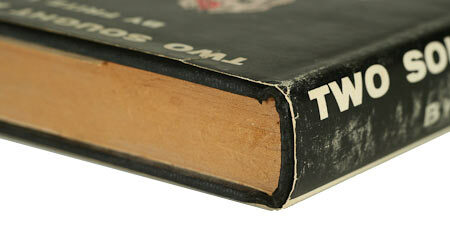 4000 copies printed, 3000 initially in black boards, 1000 in 1959–1960 in gray cloth. Currey: TWO SOUGHT ADVENTURE. N.Y. Gnome Press Inc., . 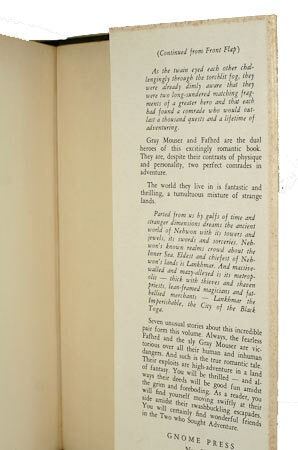 Two bindings, priority as listed: (A) Black boards stamped in red; (B) Gray cloth stamped in red, (C) Red boards stamped in black (not seen) First edition so stated on copyright page. Comments: Rubbing, as has been described above, is the major flaw with this copy. If we set that aside, it’s pretty damn good. Unfortunately though, we can’t set it aside. However, $40 isn’t outlandish for this title even in this condition. Interesting that Currey notes an unseen (C) state binding while officially recognizing only two. I was looking forward to reading this very much as a bit of an escape from the usual SF fare. As soon as I started reading it, I had my doubts about the worth of the contents. I have never liked being introduced to a fantasy book by the scene being set with what seem clumsy and contrived fantasy names and locations. It’s as if the author wants to impress with the power of his imagination and how exotic and mysterious his world must be. Maybe back in the day it was fine, but these days to this sometimes jaded and experienced reader it’s not interesting, even a turn-off perhaps unless you’re about 16 years old. However, as I often say here, when reading these stories we mustn’t be too critical in a contemporary light. We must try wind our minds back to the times in which they were written. Not an easy thing when you’re born in 1969, but as I was weaned on Heinlein juveniles and Hugh Walters around 1980 or so it’s no big deal really. I really want to pick up some Walters first editions sometime… hard to come by those. To the book at hand. While I did start with a fair bit of skepticism, that quickly disappeared as I got engaged in the capers of this pair of fearless and daring adventurers. Fafhrd and the Grey Mouser present an unlikely couple in the form of a Conanesque barbarian and a diminutive thief in the mold of a kind of a half-elf character from Dungeons & Dragons. Indeed, these characters and their world were apparently an influence in the role-playing world. You can read about them in more detail on wikipedia here. 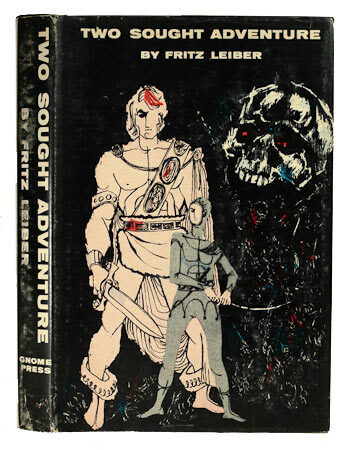 Fritz Leiber presents a bit of a tragic figure for all his ability as a writer in the realms of SF, horror and fantasy. Apparently an accomplished fencer, this skill of his comes through in excellent and believable descriptions of bouts of swordplay throughout the collection. It is a collection, did I mention that? Anyway, these two good friends engage in a bit of hack & slash and various other types of derring-do – breaking and entering, wasteland adventures and such and so forth. Their influence as literary characters and that of their world (in particular their hometown of Lankhmar) remain to this day. I recommend looking into these two more widely on the Internet. This isn’t a particularly good review. It’s the first since, well… Mutant, way back in December ’09!! Man, I’m out of practice. Still this is better than nothing and will hopefully get my Review wheels turning again. Bottom line is (and this is what we all want after all..) that this is a good collection of Fantasy tales with two very believable and human protagonists. No superhuman abilities or miraculous escapes, just excellent fantasy fun with engaging characters. If you are seeking adventure, make it three and join Fafhrd and Mouser. Highly recommended. Two Sought Adventure arrived today. The block is quite tanned, perhaps a little more than is usual and there is general rubbing all around the jacket, but other than that any edge wear and chipping is practically non-existent. Good stuff.